If your synagogue is anything like ours, the Shabbat service ends with Adon Olam. This is usually led by a prepubescent boy with questionable pitch, key, and general singing ability. This is good for the kid educationally, and should be encouraged. Musically, however, it's not always the best way to lift spirits for the rest of Shabbat and the week ahead. Back in 2010 we started a new series, presenting renditions of Adon Olam from performers worldwide, including traditional and eclectic versions. Since then we have posted 19 different versions to provide you with a fun way to start Shabbat. 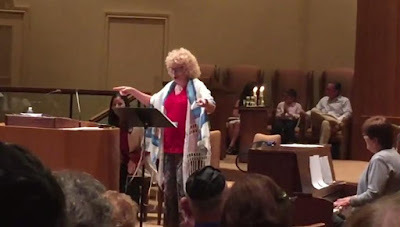 Today we find ourselves back in the USA, at Congregation B'nai Israel in Boca Raton, Florida, where as part of an annual Chocolate Shabbat Cantor Stephanie Shore led a version of Adon Olam set to the tune of A Spoonful of Sugar from the movie Mary Poppins. We can only hope that it helped the cholent go down...in a most delightful way. What a wonderful way to welcome Shabbat.